The perfect ending to a holiday meal (Thanksgiving!) 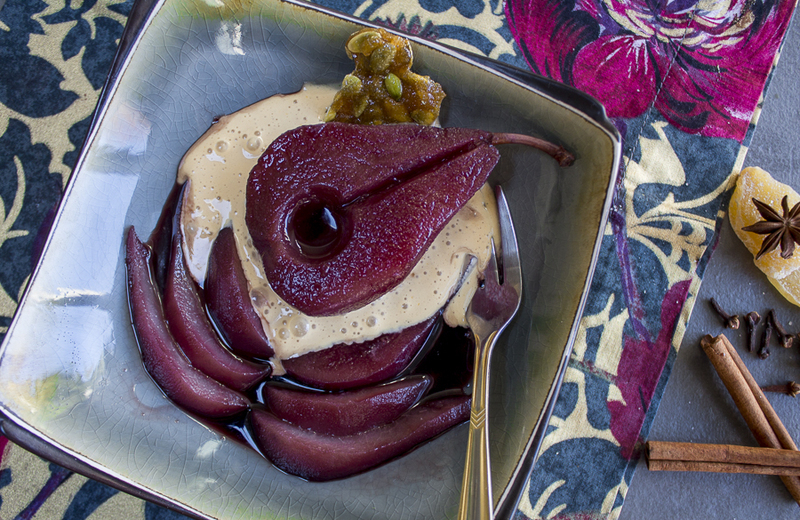 Spiced, beautiful pears swimming in a ruby syrup with a creamy zabaglione custard. Add the red wine, pomegranate juice, tart cherry juice, honey and sugar to a 2 quart non-reactive pot, and bring to a boil. Whisk until the sugar has dissolved. Add the seasonings; cinnamon sticks, anise pods, cloves and ginger. Reduce to simmer and cover. Peel pears and leave stems intact. On a cutting board, cut the pears in half – one half will have stem attached. Take out seeds with a melon baller, discard. Cut away the stringy strip towards the stem with a sharp, small knife. Bring the remaining poaching liquid to a boil, then reduce to a simmer cooking until reduced to 3/4 cup. The liquid will turn a darker hue, and be very syrupy. Strain the syrup, and place in a glass container to cool. Drain from the liquid, cut the pears halves into 6 lengthwise wedges, or serve the pear halves as is. Parfait dishes are nice and festive for serving. Top with Caramel Zabaglione (see recipe) and drizzle with the Syrup. Garnish with pumpkin brittle if desired. Pomegranate seeds are a nice garnish as well. 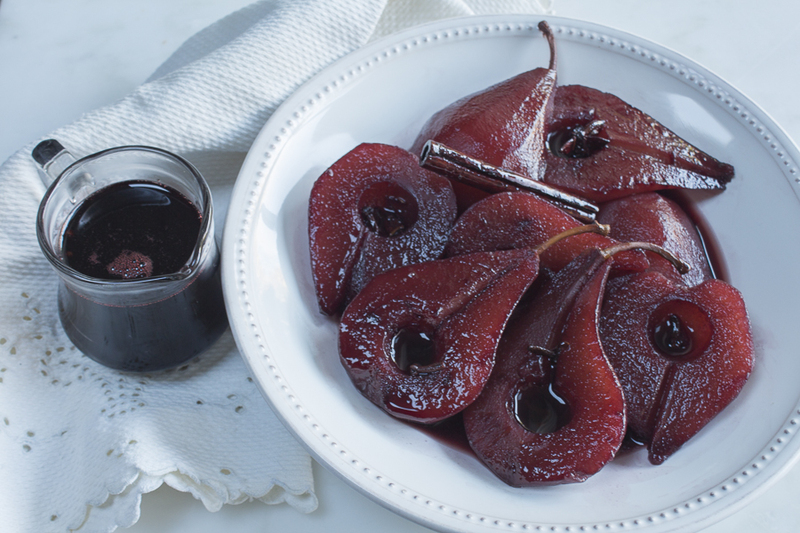 These pears are not overly sweet, and work beautifully with the Caramel Zabaglione. Servings: 8. A half pear per serving with syrup and caramel zabaglione. See the Blog for more photos and tips.